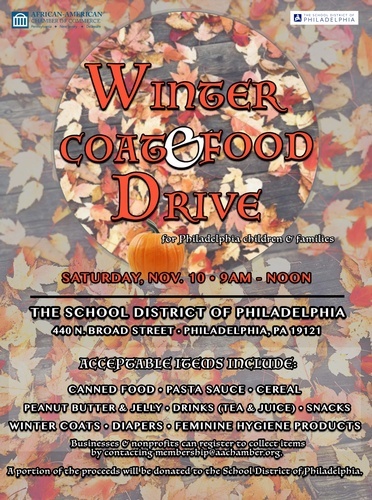 The African-American Chamber of Commerce of PA, NJ & DE's Young Professional Advisory Council is hosting a Winter Coat & Food Drive in partnership with the School District of Philadelphia. We're calling on businesses and nonprofits to collect items to benefit those in need. Items should be collected until Friday, November 9, and then dropped off at the School District of Philadelphia (440 N. Broad Street, Philadelphia, PA 19130) on Saturday, November 10 between 9 a.m. and noon. Items will be donated to a local nonprofit organization. To sign up to participate in the drive, you must register your organization through this form.